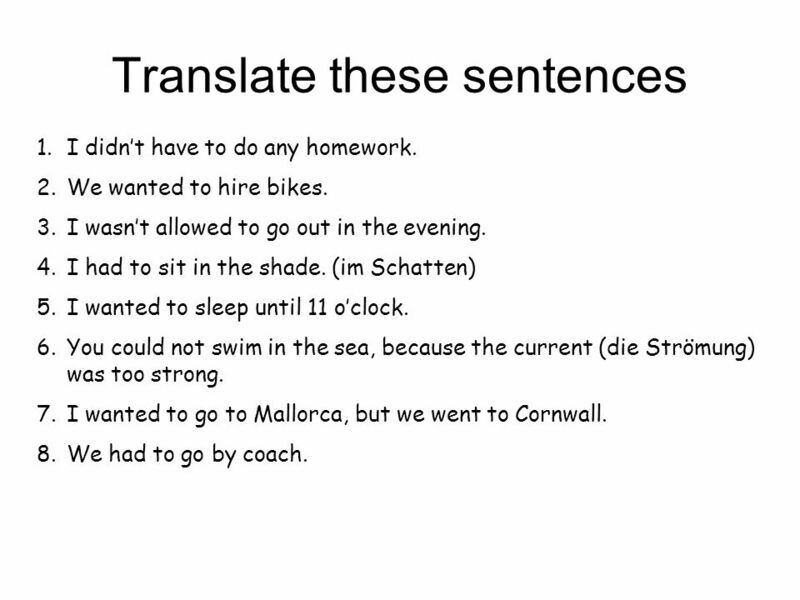 Translate these sentences 1.I didn’t have to do any homework. 2.We wanted to hire bikes. 3.I wasn’t allowed to go out in the evening. 4.I had to sit in. 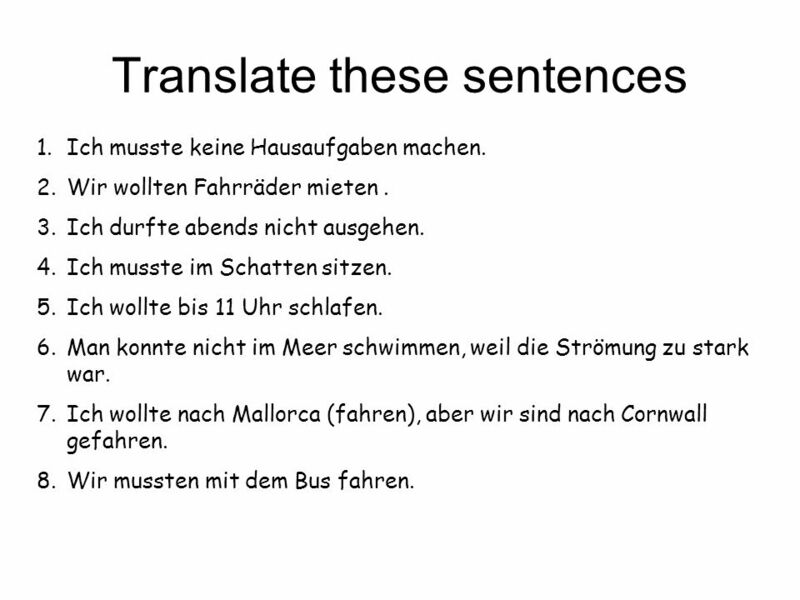 2 Translate these sentences 1.I didn’t have to do any homework. 2.We wanted to hire bikes. 3.I wasn’t allowed to go out in the evening. 4.I had to sit in the shade. (im Schatten) 5.I wanted to sleep until 11 o’clock. 6.You could not swim in the sea, because the current (die Strömung) was too strong. 7.I wanted to go to Mallorca, but we went to Cornwall. 8.We had to go by coach. 3 Translate these sentences 1.Ich musste keine Hausaufgaben machen. 2.Wir wollten Fahrräder mieten. 3.Ich durfte abends nicht ausgehen. 4.Ich musste im Schatten sitzen. 5.Ich wollte bis 11 Uhr schlafen. 6.Man konnte nicht im Meer schwimmen, weil die Strömung zu stark war. 7.Ich wollte nach Mallorca (fahren), aber wir sind nach Cornwall gefahren. 8.Wir mussten mit dem Bus fahren. Herunterladen ppt "Translate these sentences 1.I didn’t have to do any homework. 2.We wanted to hire bikes. 3.I wasn’t allowed to go out in the evening. 4.I had to sit in." Die Modal Verben wollen können müssen dürfen mögen sollen. Verben 1 Verben 2 Modal s 1 Präsens Modal 2 Imperfekt Translate! Beim 1 beim 2 Modal s 1 Präsens Modal 2 Imperfekt Translate! The Pefect Tense By Abbie (:. Deutsch 2 – Prüfung 2. Listening Section in der Küche helfen = to help in the kitchen das Auto polieren = to polish the car den Müll wegtragen = to take. Freitag, den Hausaufgabe für Montag den Culture Worksheet Turn in homework & Lernbuch Unit 7 Test Guten Tag!